Tech is trending in 2018. Despite a turn to volatile market conditions for the S&P 500, the tech sector has managed to post some standout performance in the wake of February's correction. The tech sector has charged almost 10% higher since the depths of the correction almost a month ago, besting the rest of the S&P by a factor of about two-to-one. But, as usual, not all tech trades are created equal. In fact, some primed to rally higher in March. To figure out which to focus on this month, we're turning to the charts today for a technical look at five tech trades that look ready to run from here. Leading things off is tech retailer Best Buy Co. Inc. (BBY - Get Report) . Best Buy is charging higher Thursday, up 3.75% as of this writing on the heels of positive Q4 earnings. That positive earnings performance is setting shares up with a bullish continuation pattern this month. 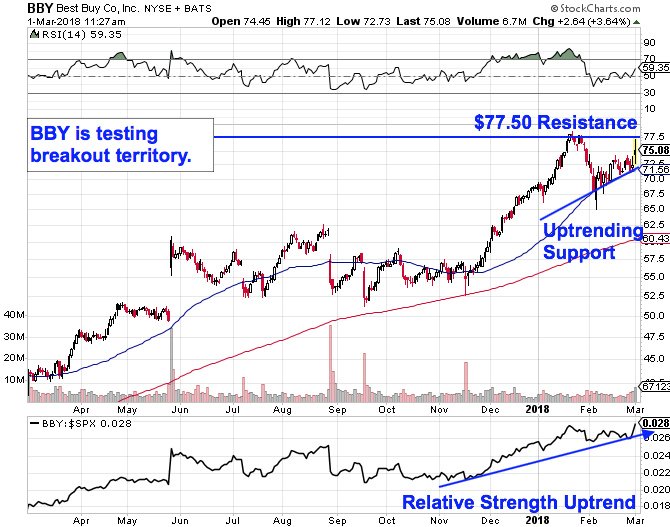 Best Buy is currently forming an ascending triangle setup, a price pattern formed by horizontal resistance up above shares at $77.50 and uptrending support to the downside. Simply put, as shares bounce in between those two technically important price levels, this stock has been getting squeezed closer and closer to a breakout through that $77.50 price ceiling. When that happens, we've got a new buy signal in Best Buy. Relative strength, the side indicator down at the bottom of Best Buy's chart adds some extra confidence to the upside potential in shares. Best Buy has been systematically outperforming the rest of the market since last fall, and that trend isn't showing any signs of slowing here. Meanwhile, an almost identical pattern is in play in shares of $55 billion video game company Activision Blizzard Inc. (ATVI - Get Report) . 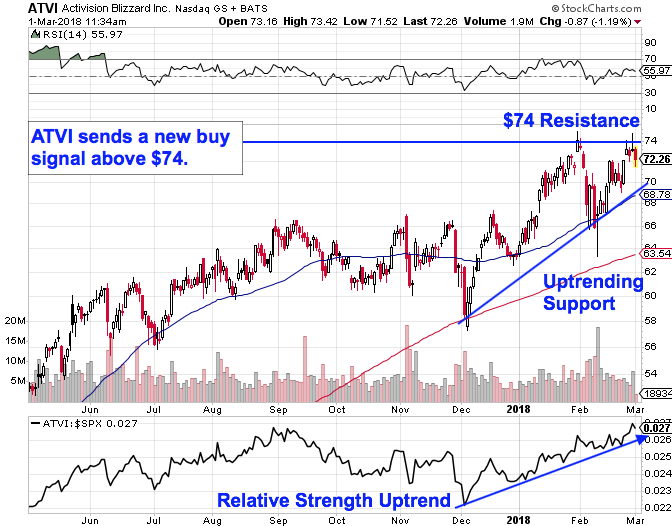 Like Best Buy, Action Alerts Plus holding Activision Blizzard is forming an ascending triangle setup, in this case with resistance up at the $74 price level. If shares can muster the strength to move materially through $74, then we've got a clear indication that buyers are still in control of shares and that it's time to join them. Risk management is key in this market - for Activision, that means parking a protective stop on the other side of prior lows at $66 once the buy signal happens. Things are even more straightforward in shares of Adobe Systems Inc. (ADBE - Get Report) . 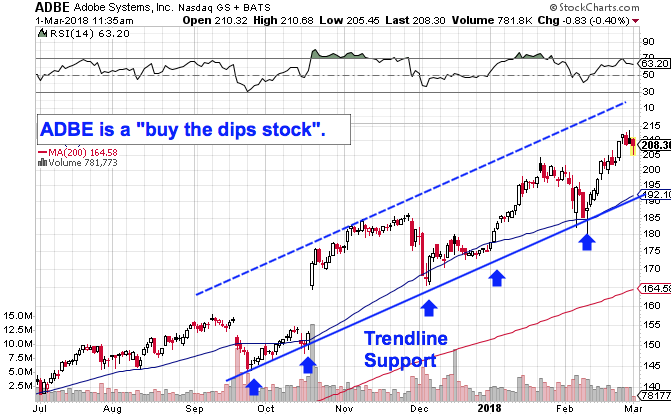 Adobe has been bouncing its way up and to the right in a well-defined uptrending channel since last fall, giving investors the opportunity to "buy the dip" on each of the last five tests of trendline support. Simply put, Adobe is a buy-the-dips stock right now - and that trend looks positioned to send Adobe higher still in March. The next bounce off of trendline support is the signal to be a buyer in Adobe. Shares of Chinese social media platform Weibo Corp. (WB - Get Report) are showing off a very similar price setup to Adobe's right now. Simply put, you don't need to be an expert technical trader to figure out what's happening in shares here; the price action is about as simple as it gets. 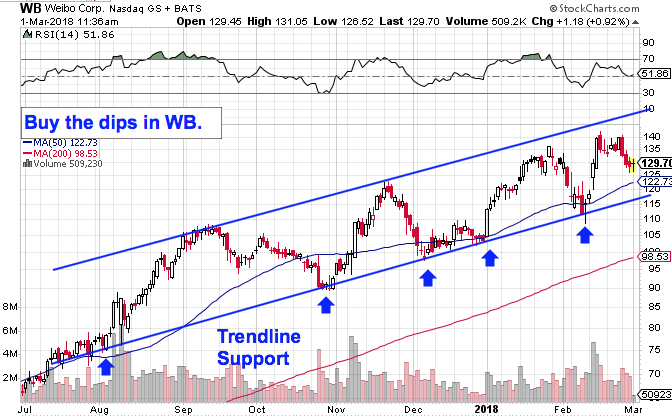 Weibo has been bouncing its way higher in a well-defined price channel stretching back to last summer - in that timeframe, every successive test of support has been a low-risk, high-reward opportunity to be a buyer. The next successful bounce off of support is a buy signal for Weibo. Finally, something very different is happening in shares of $17 billion tech firm Check Point Software Technologies Ltd. (CHKP - Get Report) . After shedding almost 8% of its market value in the last six months, Check Point is finally looking "bottomy" in the long-term. Check Point is currently in the early stages of forming an inverse head and shoulders pattern, a bullish reversal setup that signals exhaustion among sellers. 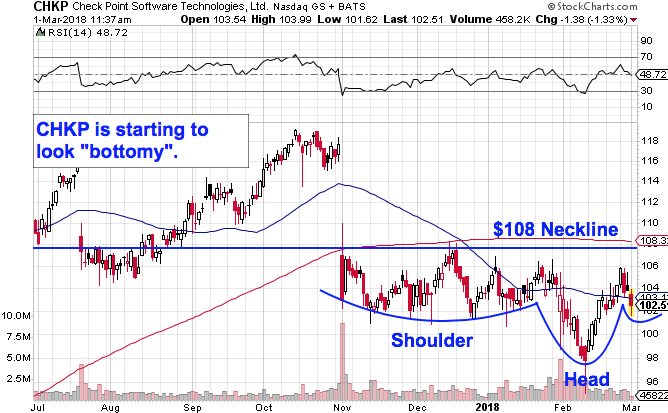 The pattern triggers a buy on a push through this stock's neckline at $108. Considering the big gap down that led to this price setup in Check Point, shares could move fast if and when a breakout above $108 happens. That's good reason to keep a close eye on shares in the sessions ahead. This is a long-term trading pattern with equally long-term upside implications if it triggers.